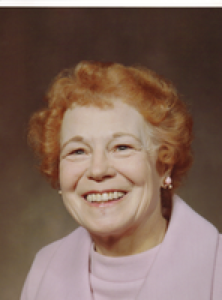 Gladys Lucile West Luckey, 92, Dorothy Love Retirement Community, 3003 W. Cisco Rd., Sidney, Ohio died at Dorothy Love on Monday, November 14, 2005 at 2:40 PM. She was born August 27, 1913 in Quincy, Ohio the daughter of Clarence Russell and Hazel Irene (Bowman) West. Surviving are two children, Lu Ann Presser and husband Randy of Sidney, Ohio and Ronald Kent Luckey of Dayton, Ohio; six grandchildren, Lisa Brown of Centerville, Ohio; Jamie Koehler of Centerville, Ohio; Angela Null of Union, Ohio; Melissa Lu Baughman of Sidney, Ohio; Randy D. Presser of Sidney, Ohio and Laura Simon of Englewood, Ohio; ten great-grandchildren, Leslie Hockaday, Rachel Kohler, Erica Starrett, Kevin Starrett, Brooke Baughman, Taylor Baughman, Justin Baughman, Randy Presser, Alyssa Presser and Jazlyn Simon. One sister, Lois Zedeker and one brother, Gerald West are deceased. She was a graduate of Houston High School and valedictorian of her class and a graduate of Miami Jacobs College. She was a member of the Federal Retirees. She was a member of the First United Methodist Church, Sidney. She began her career at Wright Patterson Air Force Base in 1943 and retired in 1975. Private graveside services will be held on Thursday, November 17, 2005 at Fairview Cemetery, Quincy, Ohio. Friends may call at Salm-McGill and Tangeman Funeral Home on Thursday, November 17, 2005 from 11:00 AM until 12 Noon. In lieu of flowers, memorial contributions may be made to the Alzheimer&#39;s Association, 3003 W. Cisco Rd., Sidney, Ohio 45365 or the Dorothy Love Life Care Fund, 3003 W. Cisco Rd., Sidney, Ohio 45365.